In the second of our series of interviews with the Crew, we take a few minutes to catch up with Deputy Coxswain Anna. So, tell us, Anna. How did you get involved with the lifeboat crew? It was about ten year ago, when I first moved to the coast from London. I was looking for a way to get involved with the local community and a friend suggested that I volunteer at the lifeboat station. I think she probably had the souvenir shop in mind, but when I saw that they were looking for members of the lifeboat crew itself, I just had to give it a go. You are one of three women on the crew now. Were there many back then? No, I was the first. There used to be a preconception that only men could be on the crew, because of the level of strength required to operate the various bits of kit. But as the lifeboats and equipment have got more advanced, it’s no longer about brute strength. And as more and more women join the RNLI’s crews, it helps others to realise that there may be a role for them, too. Do you come from a nautical background? No, not at all. When I lived in London, I worked as an English teacher in a secondary school. And I now run a small bookshop in town. Before joining the lifeboat crew, the most experience I’d had of the sea was going on a cross-channel ferry to France! But the RNLI has a fantastic training programme for new crews. And I now have the opportunity to pass my own knowledge on to newer members of the crew. What does your role as Deputy Coxswain involved? I help Coxswain Bob to manage the crew and fill in for him when he’s away. In addition to that, I run our programme of outreach activities in local schools, helping to teach the children about water safety and the work of the lifeboat service. It’s my way of staying in touch with my teaching roots, I suppose. You must have a lot of memories from your ten years on the crew. What are your favourite? I have vivid recollections of some of the rescues we’ve carried out. But my fondest memories are the ones of people we have rescued coming to visit us afterwards. When we’re out at sea, we rarely have time to chat with the people we’ve dragged from the water or towed in from a storm, so it’s a real pleasure to be able to sit down and have a cup of tea with them. We know that our work’s important, but talking to the people we’ve helped and hearing their stories really brings it home. Being on the lifeboat crew is serious business. But have there been any funny moments? What has been the biggest change in the lifeboat service over your ten years on the crew? I would say that it has to be the nature and amount of training that we’re able to offer to our crews. We’ve always had good training, but as the boats get more complex and the equipment that we have access to becomes more advanced, it’s important that we’re always at the top of our game. We train regularly here at the station, but we also now have fantastic training opportunities at the RNLI College in Poole. We may be volunteers, but we have access to world class facilities. What advice would you give anyone who wants to get involved with the lifeboat service? There are so many ways to get involved that there truly is a role for everyone. It’s often the sea-going crew that first come to mind when people think of the lifeboat service, but there are a huge number of other roles, too. Shore helpers, tractor drivers, education volunteers, fundraisers, press officers, station guides, shop volunteers… the list goes on and on. 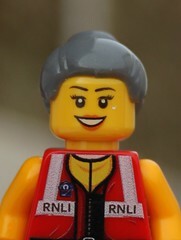 So if you think you’d like to get involved, have a look on the RNLI volunteering website. Or just pop down to your local station and have a chat. This entry was posted in Interview with the Crew and tagged Deputy Coxswain Anna, Interview, Lifeboats, RNLI, The Lifeboat Crew by Simon Perks. Bookmark the permalink.